You can't go wrong with a flourless chocolate cake. It's pretty much a foolproof dessert and this version from Baked did not disappoint. 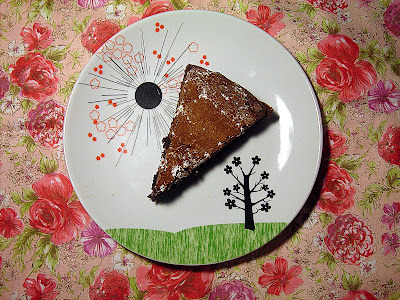 It was rich and moist, just like a flourless chocolate cake should be. I suppose there are people who may find this and other flourless chocolate cakes too chocolaty, but that's just crazy talk. In my opinion, there is no such thing as too chocolaty! Besides, in addition to being totally delicious, and easy to make, the flourless chocolate cake manages to be totally gluten-free, without even trying! Yay! I did make one small change to the Baked recipe, though. I wanted to snazz things up a bit, so I added two tablespoons of cinnamon. That's right, two tablespoons! You can, of course, leave that part out. Also, Baked gives you an option of adding a chocolate glaze, but I was short on time, so I just made the cake and then dusted it with powdered sugar and cocoa. Preheat the oven to 350 F. Generously butter the sides and bottom of a 9-inch springform pan. Line the bottom with parchment paper and butter the parchment. Using a double boiler or a microwave, melt the chocolate and set aside to cool. In the bowl of an electric mixer fitted with the paddle attachment, beat the butter and sugar together on high speed until pale, light, and thoroughly combined, about 5 minutes. With the mixer on low speed, add the egg yolks, beating well after each addition. After all the eggs yolks have been incorporated, scrape down the bowl and beat for 10more seconds. Add the cooled chocolate and mix until combined. Scrape down the bowl, add the vanilla and beat until just incorporated. In a large bowl, whisk the egg whites and salt until soft peaks form. Scoop 1 cup of the egg white into the chocolate mixture. Use a rubber spatula to gently fold the egg whites into the chocolate mixture. After 30 second of folding, add the remaining egg whites and gently fold in until almost completely combined. Pour into the prepared pan and use a spatula to smooth the top. Bake for 30 to 35 minutes, until the top of the cake seems set or firm to the touch. Be careful not to overbake. Transfer to a rack and let cool. 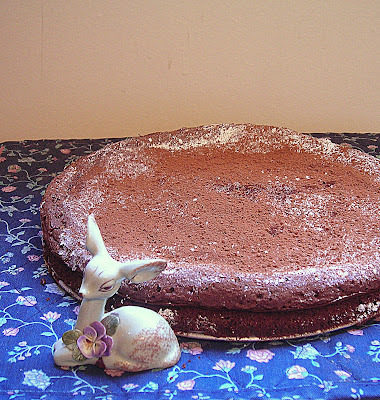 Use a small knife to loosen the cake from the sides of the pan. Remove the springform sides. Invert the cake on the rack, peel off parchment, and flip the cake back upright. yum, i love making this cake. i have made a vegan version with fresh brewed coffee that's delicious! Yum! Sounds so good, and cute plate! Thanks! It's from Urban Outfitters. They have the best plates there! I am currently craving chocolate in a bad way and your recipe is not helping matters at all. Yum!!! The plate is from Urban Outfitters, but I bought it a couple of years ago. I just checked their site and it doesn't look like they have it anymore. Sorry! The do have a lot of cute plates and bowls there, so I would definitely check it out in the future.